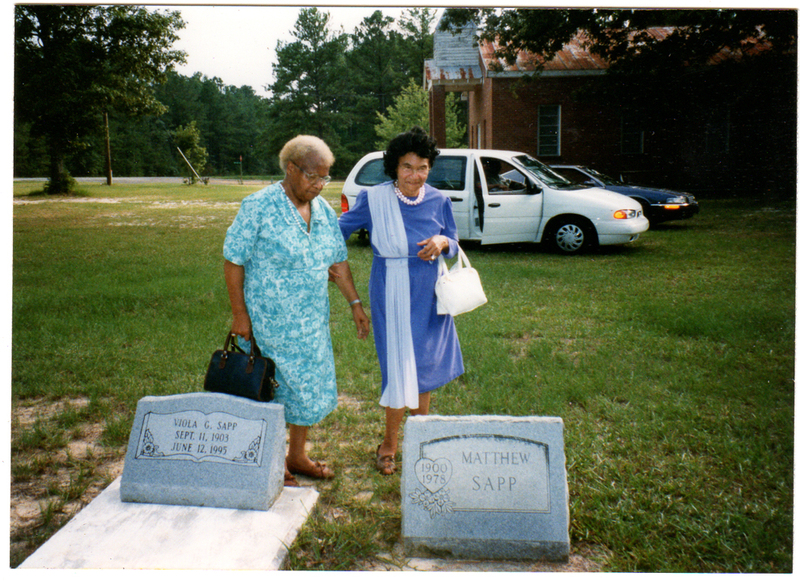 This is a photo of two sisters visiting family graves probably in Jenkins County. Irene to the left is my grandmother, who at this time was suffering from Alzheimers. She is being led by her baby sister, Vivian, who will be 90 years old this year. She too is now suffering from Alzheimers. I know that Matthew Sapp was their uncle and I do remember him quite well, but I don't know who Viola Sapp is and why she is buried right next to Matthew Sapp. I know Matthew had two wives, Beaulah and Lizzie. I don't have much info on Lizzie, and it is possible that her name was Viola. I am hoping that someone can answer this question for me.